Long travel days, unfamiliar beds, and hours hoofing it around new places can do a number on your body and mind. Traveling with a yoga mat can give you the opportunity and space to work out and unwind, even in the tiniest hotel rooms. If you have a favorite yoga mat, you can fold it to fit in your bag. However, regular yoga mats can be bulky and heavy, so you might want to consider getting a special yoga mat designed for traveling. My favorite yoga mat for travel is the eKO SuperLite® Travel Mat by Manduka. It weighs about two pounds and folds up easily. It’s grippy on both sides, and it’s rugged enough to be stable even on plush carpet. Be aware that it’s made of rubber, so if you practice hot yoga, the sweat might cause it to deteriorate quickly. >> Check out the eKO SuperLite on Amazon. The Lululemon Un Mat is comparable to the Manduka eKO SuperLite®. An affordable option is the Gaiam Travel mat, which is reversible, with an absorbent side handy for sweaty vinyasa classes, and weighs only one pound. There is also the Jade Travel Mat, which is a bit heavier at 3.5 pounds, but it’s a good choice if you need more cushioning because it’s also a bit thicker than many travel mats. >> Check out the Gaiam Travel Mat and the Jade Travel Mat on Amazon. The mat itself is one of the best on the market, if not the best. Yoga teachers are always recommending it, and I can see why – I wouldn’t want to use any other mat now. So yes, if my friends who travel a lot love yoga, I always recommend it. Practicing on this mat makes the world of a difference, as it’s got the perfect amount of padding for all those poses! It does take a substantial amount of space in my backpack, so I now have a mat carrier that I take as a carry-on. I just pop it in the overhead compartment and try to remember to reclaim it when I’m rushing off the plane after we land! >> Check out the Manduka PROlite yoga mat on Amazon. If I know I’m going to be doing a lot of yoga on a trip, I’ll pack both a yoga mat and a full length mat towel for extra comfort. If you’re short on space, you can just pack the yoga towel. It’s less bulky and lighter weight than a mat, and though it won’t have the cushioning of a yoga mat, it will still do the job of protecting you from dirty hotel floors. The Yogitoes Skidless towel has little grippy bumps on the bottom so it won’t slip around on the floor or on top of a regular yoga mat. >> Check out Yogitoes on Amazon. They are available in lots of fun colors, weigh only 1.25 pounds, and are also really durable. I’ve had one for several years that’s still like new! A plain microfiber towel like the Manduka eQua, which weighs only one pound, can double as a beach towel or picnic blanket. Just make sure to skip the fabric softener on your yoga towels or they will lose their magical non-slip super absorbent properties. >> Check out the Manduka eQua on Amazon. I use a lightweight day pack and put my folded mat in it if I’m visiting a yoga studio on the road, but a mat sling like this one from Gaiam for toting your mat doesn’t take up much room if you prefer to roll it once you’re at your destination. Many backpacks offer compression straps and elastic bands that can be used to attach a rolled yoga mat to the outside. If yoga is big on your list, buy a backpack with those features in mind. See more of Flissy’s yoga travel information in her packing list for a yoga retreat. Do you travel with a yoga mat? Share your favorite mats and ways to pack it in the comments below! This post contains affiliate links. If you make a purchase using them, we will receive a small commission at no extra cost to you. It helps to keep this site running – thank you! Flissy has been a life-long traveler, having been spoiled by parents who took her all over the US and abroad throughout her childhood and young adult years. An E-RYT 200 yoga instructor and professional tribal style belly dancer, she loves to travel to study belly dance and yoga, as well as for hiking and fun with her husband. She can be found blogging about yoga, dance, and travel at www.omchantress.com or on Twitter, @omchantress. Thanks for the tip Kaylin – we’ll have to check them out! Great guide Brooke! 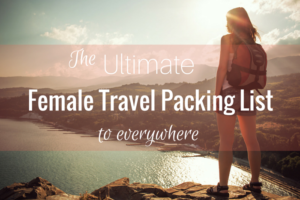 I travel with the Manduka eKO superlite and find that even with a light sweat it works great even without a towel which saves some room for packing. Been using the Manduka for 3 months and counting while traveling through Asia. It’s been working great, super light and sticky, but it is REALLY thin which means kneeling poses hurt my knees after a while. Overall, my favorite traveling yoga mat I reviewed. Just checking out this post and wanted to say that these are great recs – I personally love the Jade Voyager mat. Also, there are lots of new options out there that are even smaller and more eco-friendly.